… plus TONS of other treats! And not just of the candy-in-my-trick-or-treat-bag variety, although there’s plenty of that, too! 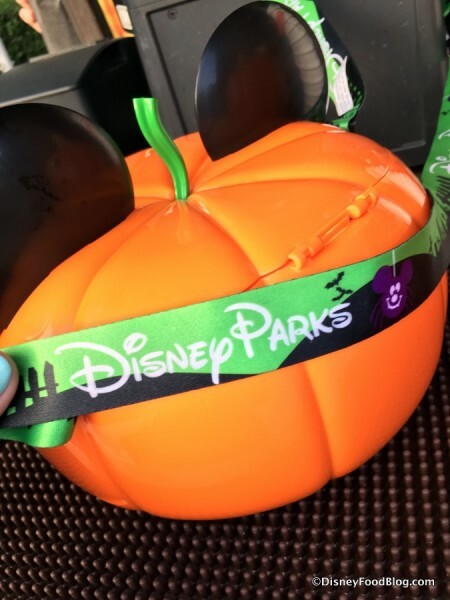 With Trick-or-Treat locations all over the park and Cast Members giving out sugar by the handful, you’re sure to fill your candy bag (find said candy bags at treat locations — they weren’t giving them out at the front of the park last night). Just look for these handy trick-or-treat location markers (spots are marked on the Party Map as well). They’re fun, colorful, and they ALWAYS mean there’s candy nearby. Once again this year there are great allergen-free treats for those in need. 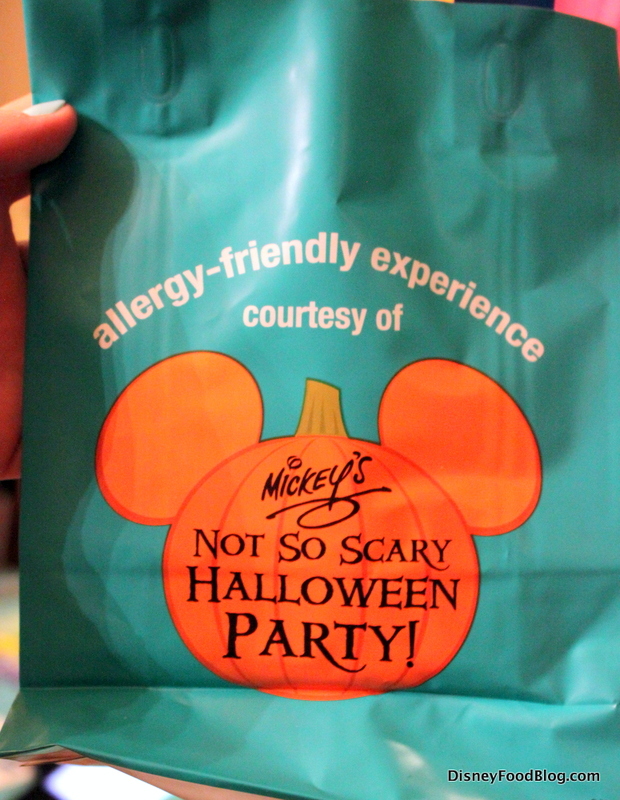 Simply request one of these designated teal trick-or-treat bags. (Teal is the chosen color for allergy awareness at Halloween.) 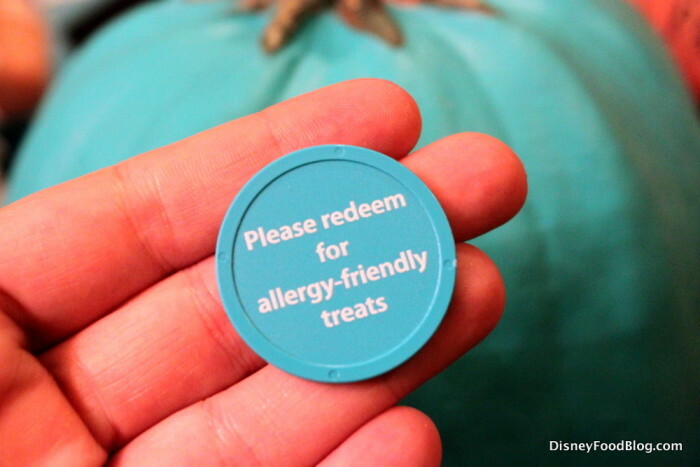 You can find the allergy-friendly centers in Liberty Square and at the front of the park next to Tony’s Town Square. At treat locations, you’ll receive a token to exchange for treats that work for you or your little Trick-or-Treater! 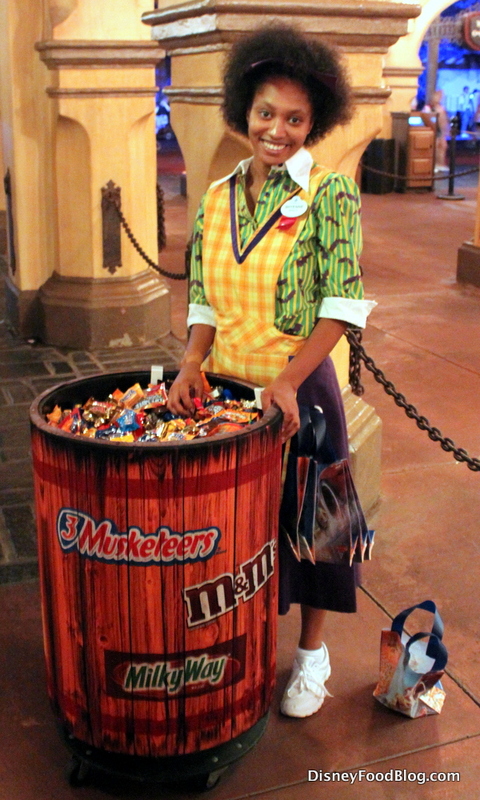 Helpful cast members will assist you in finding terrific treats — no tricks required! 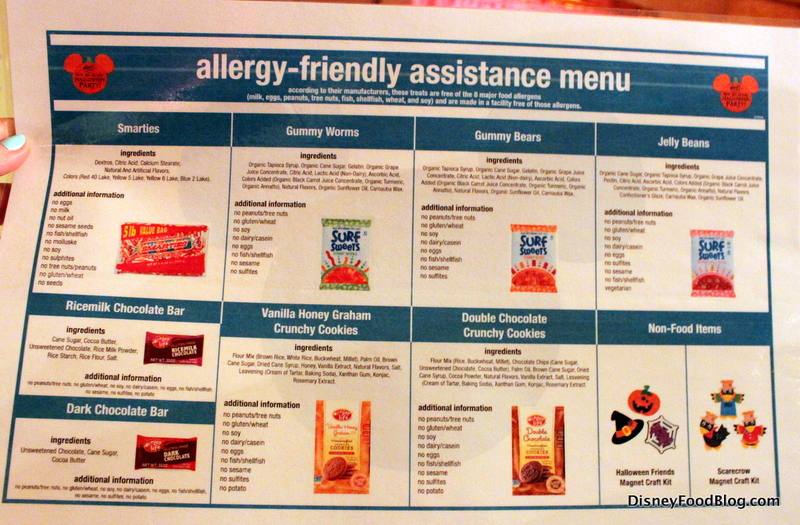 There’s also an allergy-friendly assistance menu to make things even clearer. The menu includes allergen info, as well as ingredient lists. There are even non-food options like magnet craft kits. Totally cool! Of course, once you’ve blown through the candy, you’ll still find several special Halloween-inspired desserts available for extra purchase. Like cinnamon rolls. And ice cream. And waffles (with MORE ice cream). There’s plenty of that and more to be found throughout the park. In fact, a few items are available all day — which means you don’t need a Party ticket in order to partake! 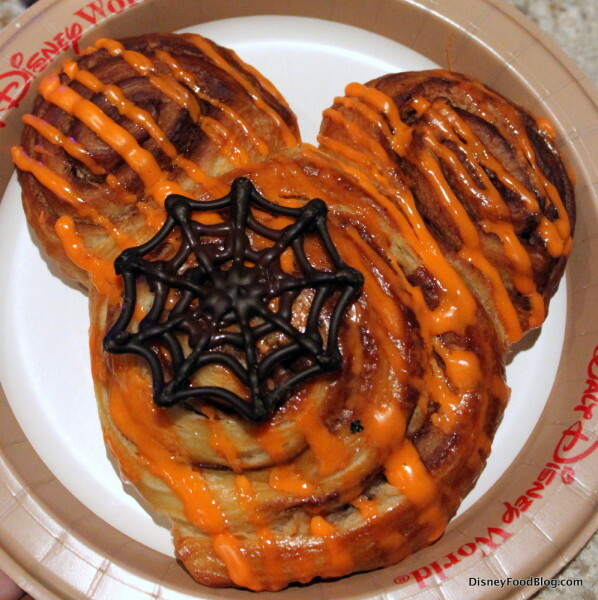 Start your day off right with this Mickey-Shaped Cinnamon Roll — complete with ooey, gooey orange glaze and a creepy chocolate spider web. Find it at Main Street Bakery! It fills the entire plate, so the whole fam will love tearing and sharing pieces of it. The roll is packed full of swirls of cinnamon! Though I ALWAYS prefer icing, the orange drizzle is festive, so I’ll give it points for that 😉 . I do love the addition of the chocolate spider web. FYI, Disney, you should drizzle this whole thing with chocolate in addition to icing. Or maybe put chocolate chunks in there a la pain au chocolat. It would be EPIC. And Pumpkin Ice Cream can be found at Plaza Ice Cream Parlor all day long, too! 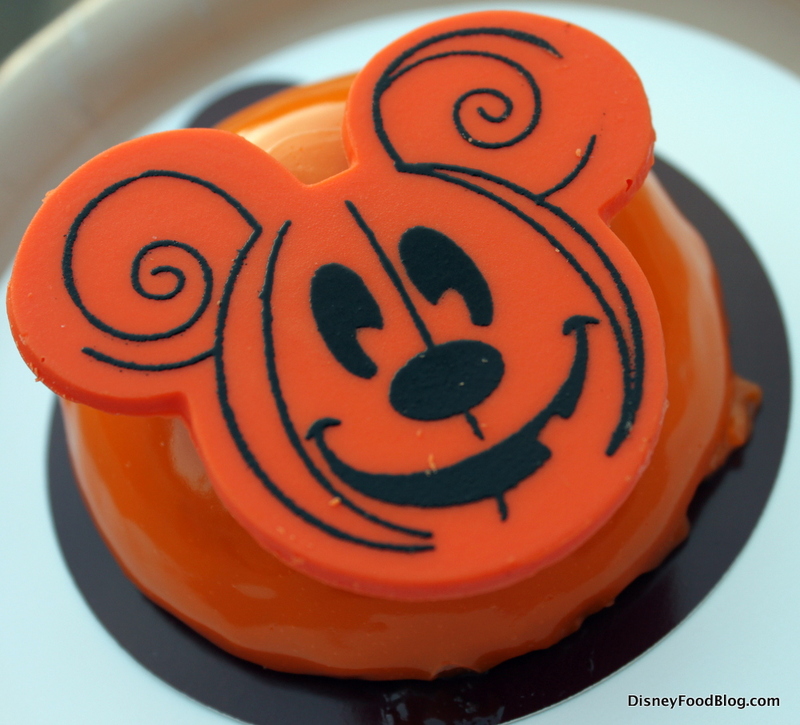 Also available at Main Street Bakery is the Halloween Mickey Cupcake. This is a chocolate cupcake filled with purple marshmallow fluff and topped with orange-tinted vanilla buttercream. And that cute Scarecrow Mickey is white chocolate. This might be a good option if you’re traveling with a picky sweets eater, but I recommend saving your cash and calories for something a little more special… ESPECIALLY if you’re attending the Party. Because… well, you’re about to see. 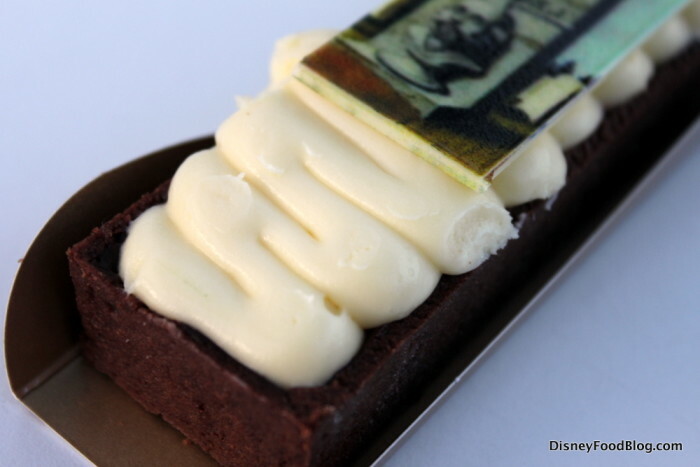 Welcome, Foolish Mortals… to this year’s Party-exclusive snacks! Mickey has conjured up some extra spooky and special treats for his guests this year! 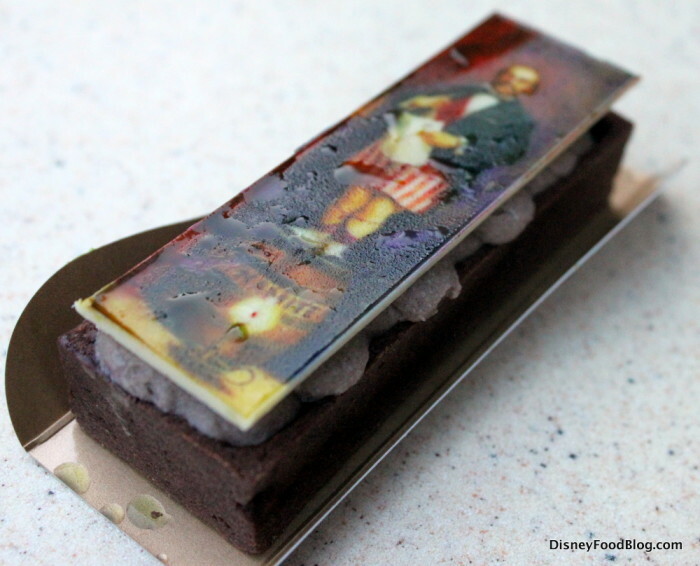 I’ll say it again… HAUNTED MANSION PORTRAIT DESSERTS!!! Okay, better yet, let me SHOW you. There is a collection of FOUR tarts creeping around the park this year, and you’ve got to stop by FOUR DIFFERENT HAUNTS to find them. 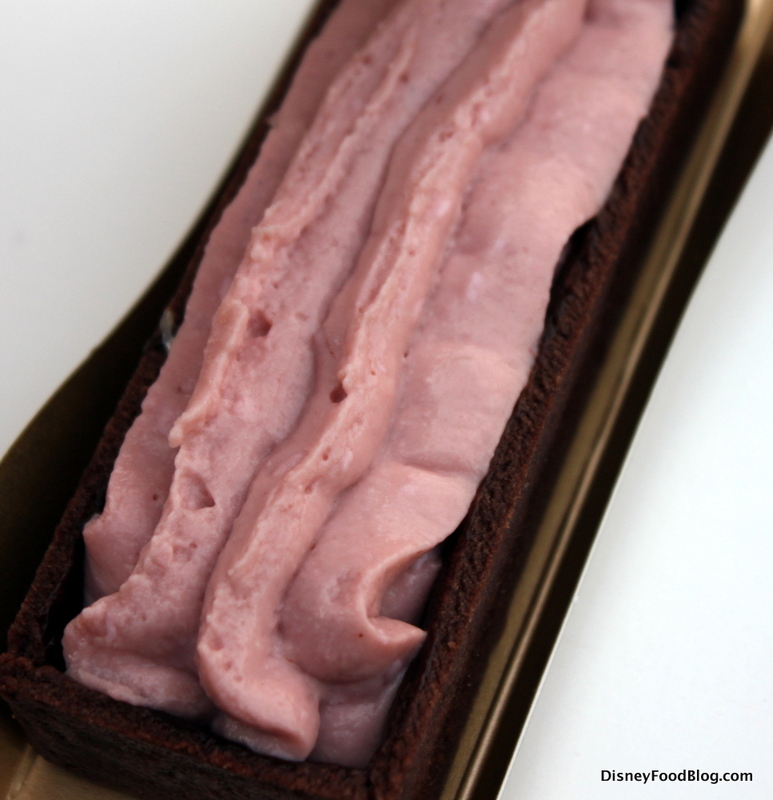 I grabbed the Chocolate and Peanut Butter Quick Sand Stretching Room Tart at Liberty Square Market! A crisp chocolate tart shell is filled with creamy chocolate ganache, which is topped with a fluffy swirl of peanut butter icing. But the obvious piece de resistance is the white chocolate Stretching Room Quick Sand Portrait topping the whole thing. 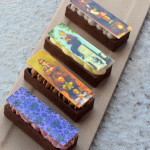 Chocolate and peanut butter and stretching room: oh my! SO yummy! And SOOOO flippin’ Instagram-ready!! This one was BY FAR my favorite of the four. 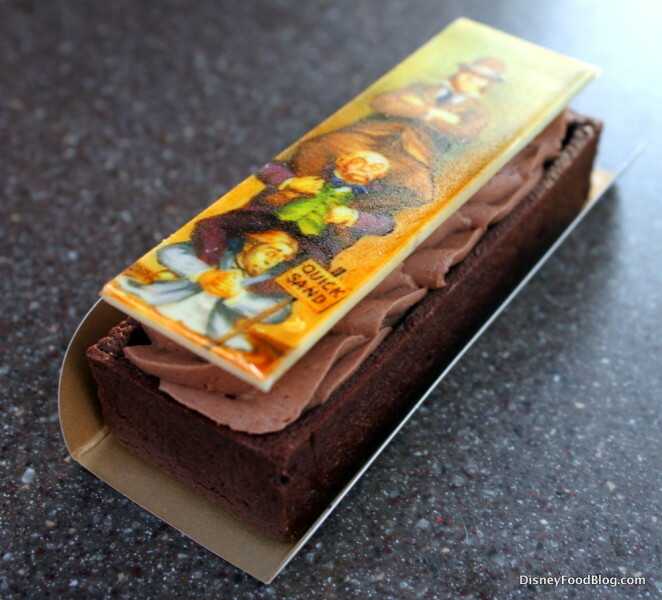 Aloha Isle is where I scared up the Oreo Chocolate Tart topped with the Dynamite Stretching Room Portrait! 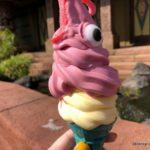 (But there’s no reason you can’t also get a Dole Whip while you’re there. Just sayin’). Inside there’s a layer of fudgy chocolate ganache on top of the slightly crumbly tart shell. Then there’s a layer of Oreo panna cotta giving off all kinds of Grey Stuff vibes! 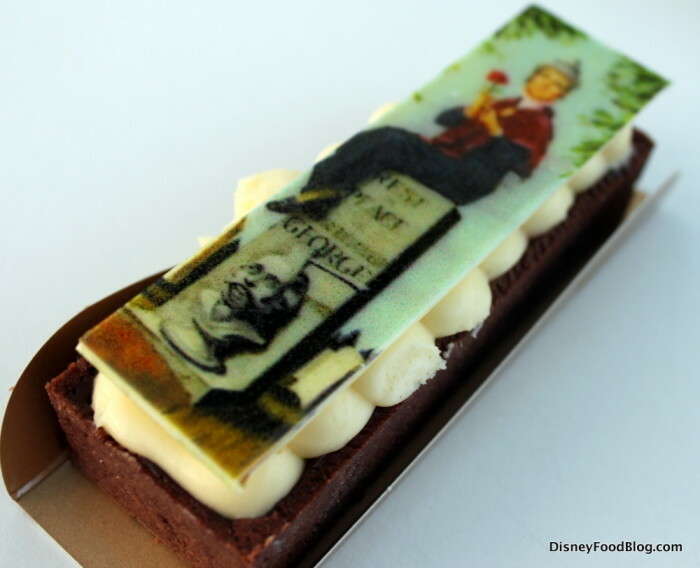 The Lemon and Strawberry Graveyard Stretching Room Chocolate Tart is available at Storybook Treats in case you’re looking for fruity favors (or you just want to pay tribute to Dearly Departed George). 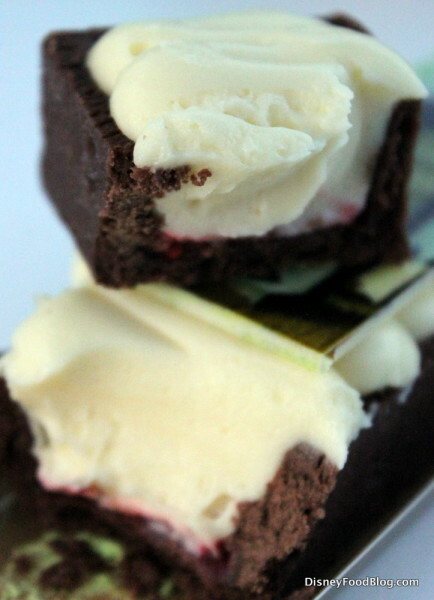 Inside is a thin layer of lemon curd with strawberry compote further topped with mousse. It’s that sweet and sour flavor combo I love! It didn’t look or taste like strawberry to me. I’m pretty sure this is white chocolate mousse, so maybe there was a mistake in the signage? Or a mistake in the kitchen? Either way, it tastes delicious, so I’m not complaining. (I’m not sure about ol’ George, though). Just something to keep in mind when you go looking for yours. The other fruit tart option is the Raspberry Chocolate Haunted Mansion Wallpaper Tart, and you can find it at Auntie Gravity’s Galactic Goodies. 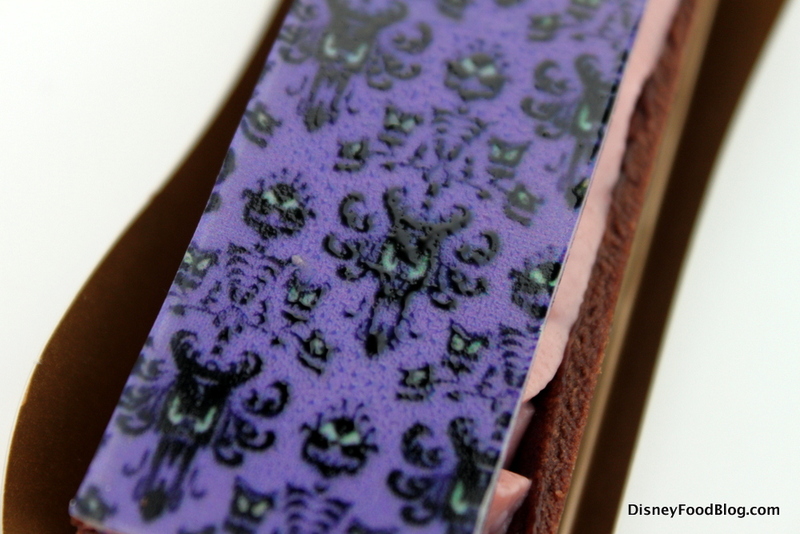 In this case, I just can’t get enough of the white chocolate topper printed with Haunted Mansion Wallpaper! How do I scream with glee in writing?! If you can bear to break up the wallpaper, there’s some great raspberry flavor to be found. There’s a bit of creamy custard underneath, along with raspberry compote. It’s totally raspberry mousse. So, again, double check if it matters to you. It might’ve just been a mix-up on the night I was there. Still. HAUNTED-MANSION-PORTRAITS-SO-I’M-LETTING-YOU-KNOW-BUT-YOU’VE-STILL-GOTTA-GET-‘EM-ANYWAY. Really, they’re the star of the specialty desserts show. But that doesn’t mean there aren’t lots of other tasty treats to be had! 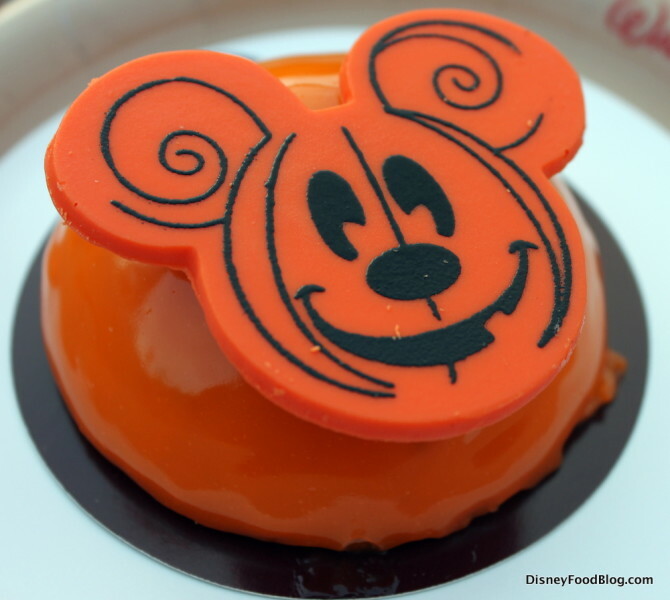 Gaston just can’t help but put himself front-and-center in the party scene with this Amorette’s-worthy Mickey Pumpkin Cheesecake Dome he’s serving up at Gaston’s Tavern. This indulgent treat features a graham cracker streusel base (mine was thin-to-nonexistant, so don’t get too excited on that front) and a thick dome of pumpkin cheesecake! 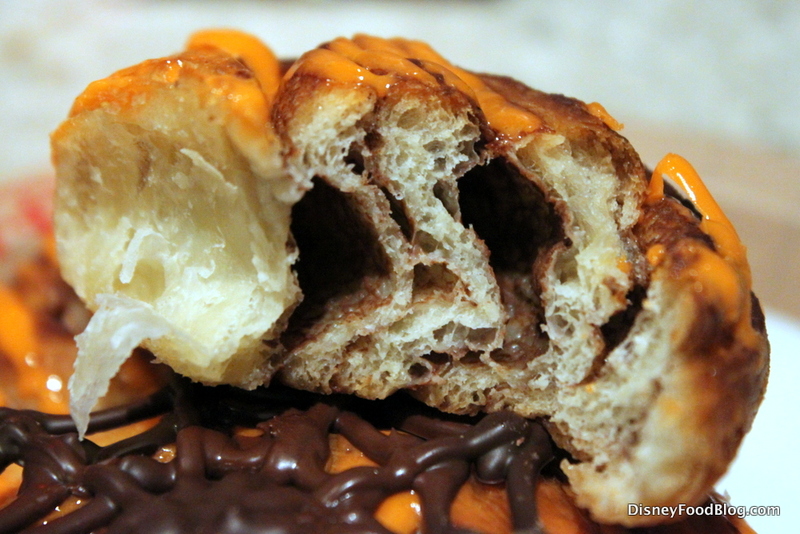 The shiny glaze is orange-tinted white chocolate, and a white chocolate Mickey jack-o-lantern smiles up from the top. It’s as deliciously sweet and pumpkin-y as you could possibly want. And it can’t possibly get any cuter. 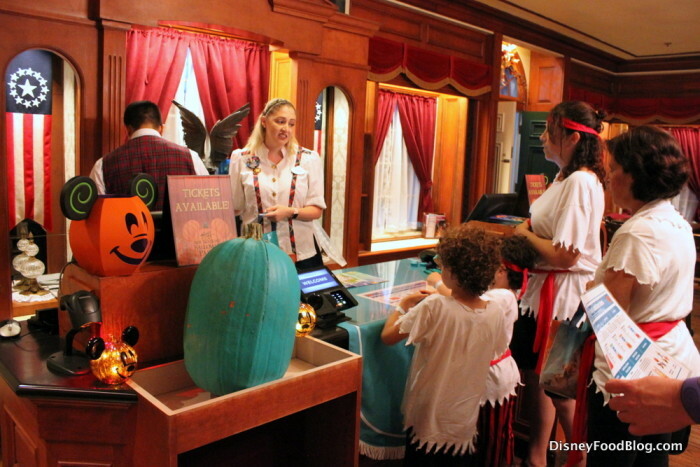 Another pumpkin-spiced treat can be scooped up at Sleepy Hollow Refreshments. The Pumpkin Mickey Waffle Sundae has returned with an added bonus. 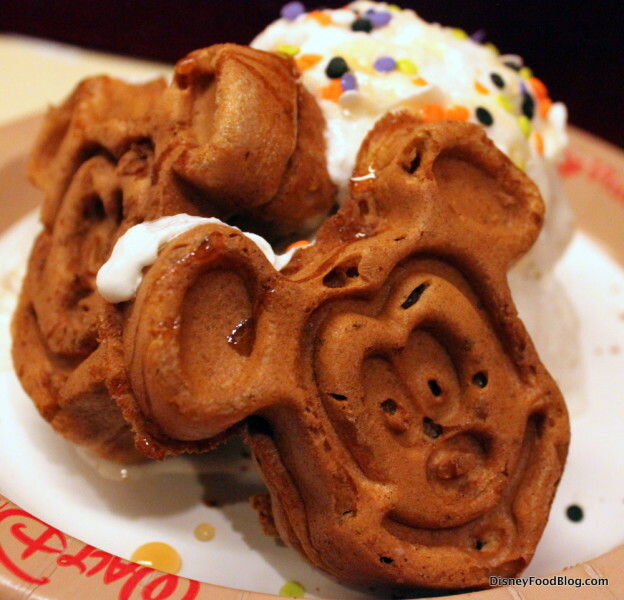 Because those hot pumpkin waffles are MICKEY Waffles this year! They’re served with a scoop of vanilla ice cream, whipped cream, sprinkles, and caramel sauce. Now, I think people are super excited about this pumpkin waffle thing — the line at Sleepy Hollow was LONG all night — but this was the least impressive treat. 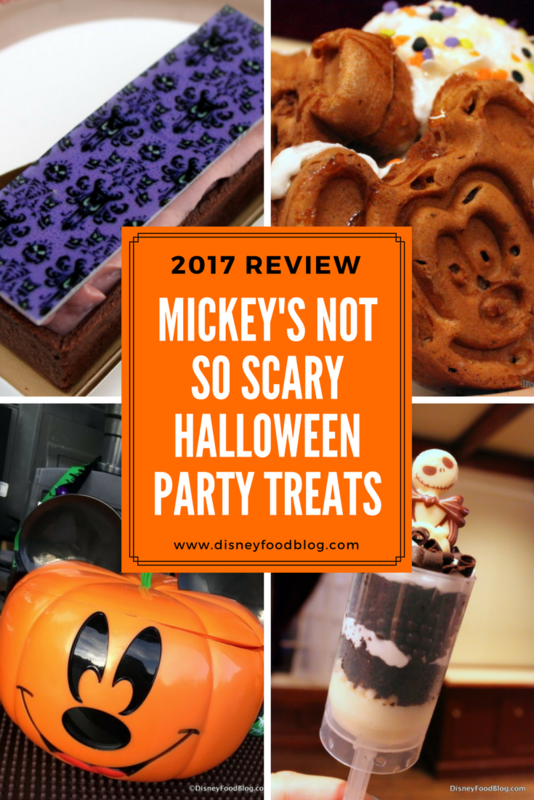 The pumpkin Mickey waffles are super cute, and do taste pumpkin-y, but overall the dessert was not as great as you would think. Just be prepared. 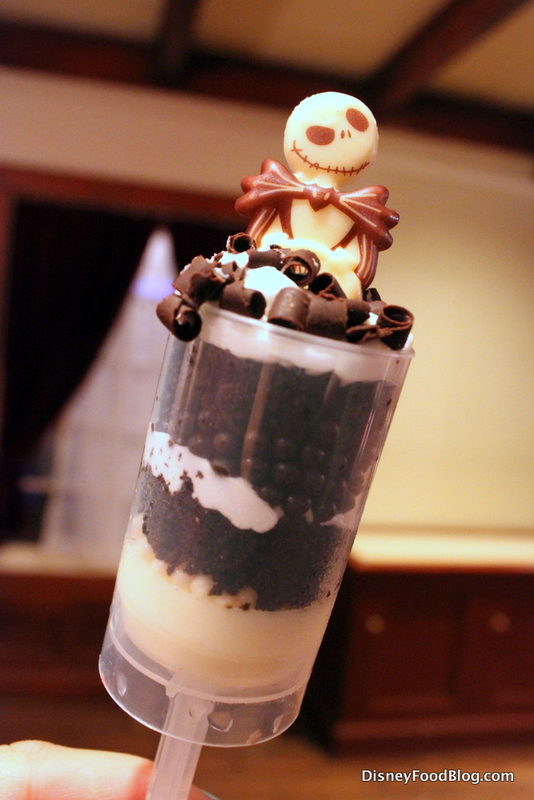 Sleepy Hollow is also home to the Jack Skellington Push Pop-style Dessert. This ain’t your kiddo’s push pop, people! It starts with a base of vanilla panna cotta (which is 100% milk jello…this is as panna cotta-y as I’ve ever seen…gross), which is topped with layers of vanilla crisp pearls (boring), chocolate cake (meh and dry), vanilla buttercream (YUM), chocolate crisp pearls (blergh), whipped cream (where? ), and chocolate curls. Jack himself (in white chocolate form) holds court above it all. His crooked grin is everything, but, again, this one isn’t really worth your time unless you SUPER have to social-media the thing. It’s cute and fun, but not worth the money or stomach space. 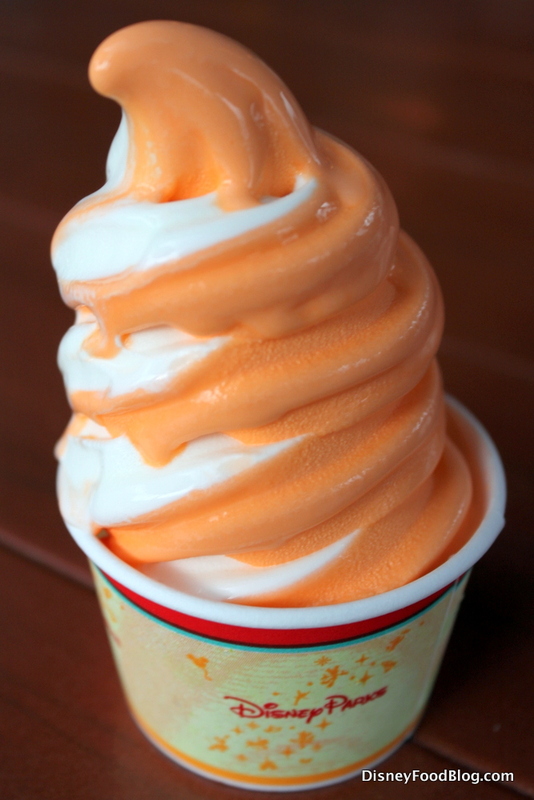 Remember: the Candy Corn Soft Serve Ice Cream switched locations this year. 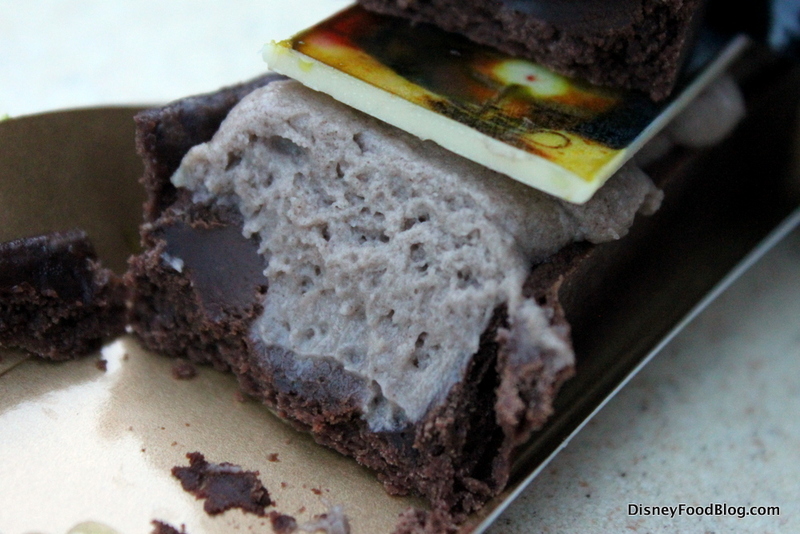 For years it’s been located at Storybook Treats, but this year you’ll find it at Auntie Gravity’s Galactic Goodies. Kiddos will love the Worms ‘n Dirt available at Pecos Bill Tall Tale Inn and Cafe. 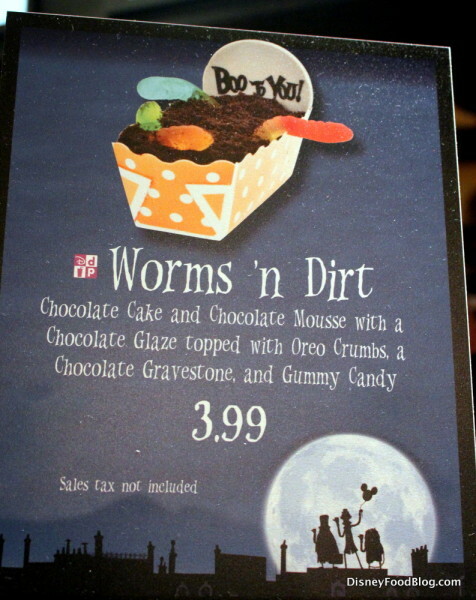 There’s a base of chocolate cake buried in there, making it a little more special than your average worms ‘n dirt. 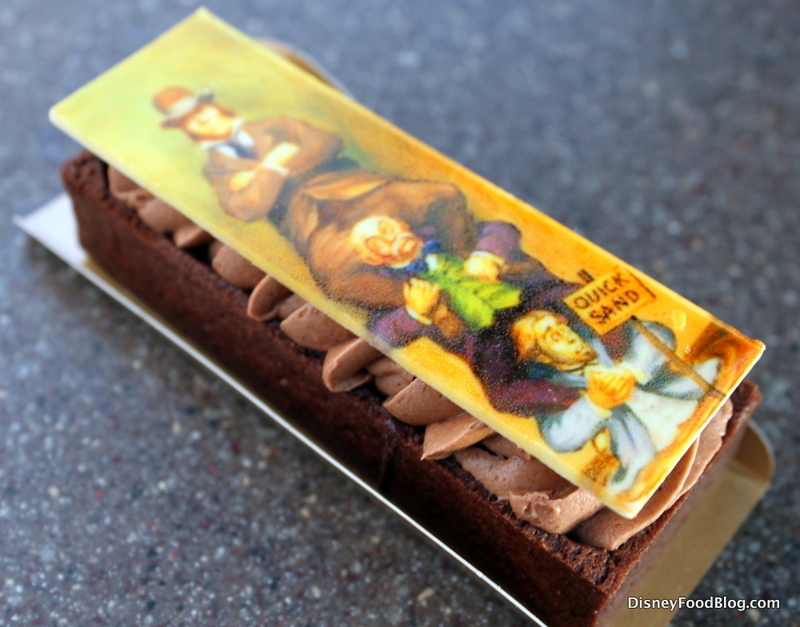 Now by the time I got over to Pecos Bill’s I’d videotaped and live streamed the parade and fireworks, eaten EVERYTHING, and…they closed JUST as I went over to get the cake. No joke. 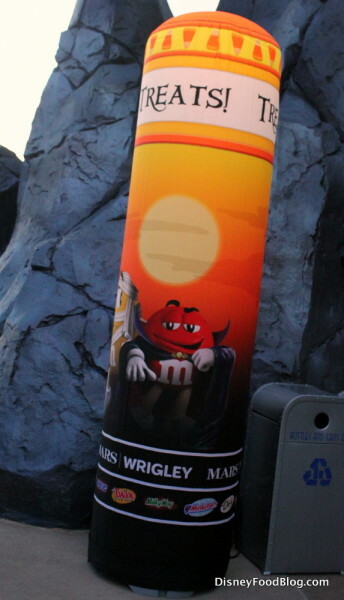 So if one of you got a pic of this little guy, send it on over and we’ll add it to the post! And the Boo to You tombstone celebrates the night’s Party-exclusive parade. 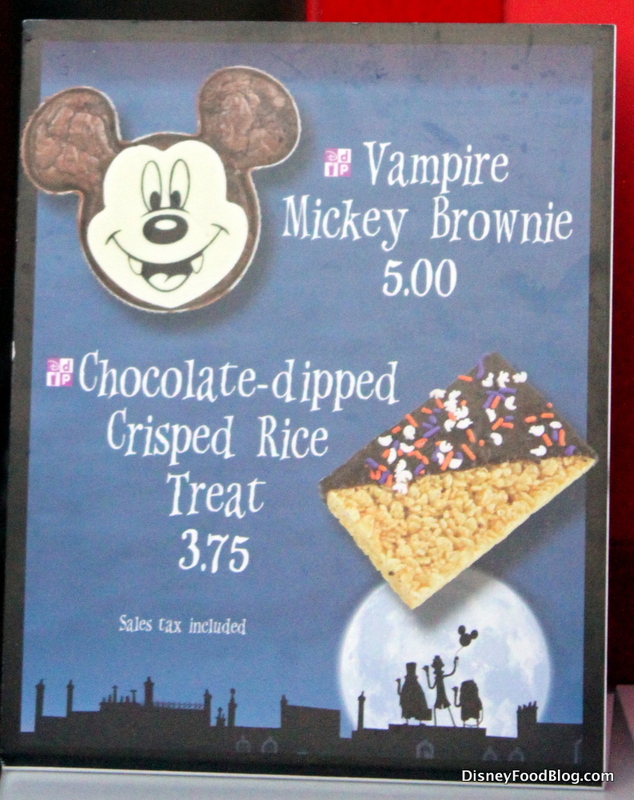 Located at carts throughout the Kingdom, you can pick up a Vampire Mickey Brownie and a Chocolate-Dipped Crisped Rice bar. 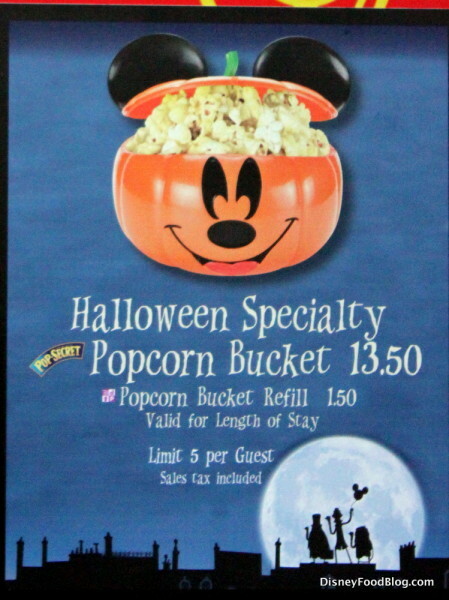 And, as in years past, you can also grab a Themed Popcorn Bucket! But this year… it’s REFILLABLE, Y’ALL! Holla! 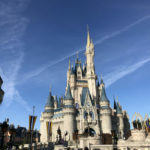 With so many seriously awesome treats to try this year, you’ll either need to prioritize your snacking, sacrifice some time with attractions and costumed character meet-and-greets, or strategize with your traveling buds to divide and conquer! Whatever your plan of attack, I hope you have as much Not-So-Scary FUN as I did! 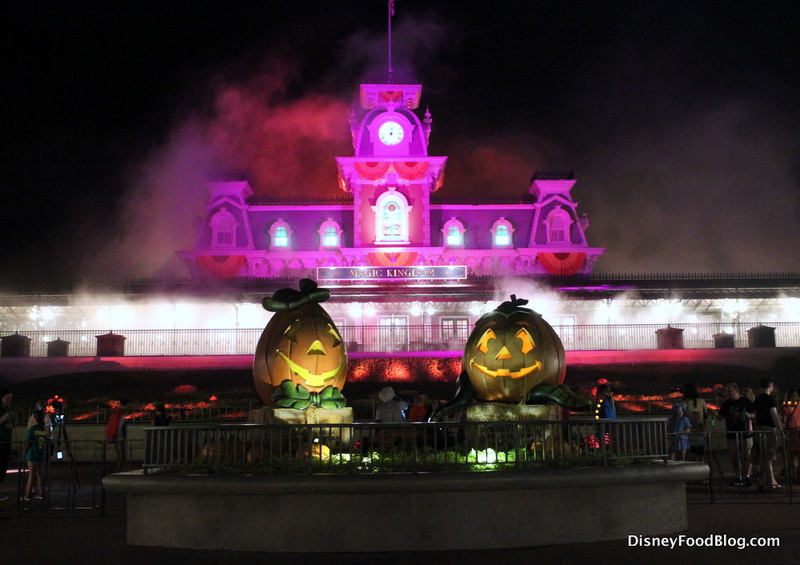 Will you be joining Mickey for his Not-So-Scary Halloween Party this year? Let us know what you’re most excited to try! Thank you for your review. They always help when we go to know all of the new things and where to get them. Saves me a lot of time. Going next week. Not that I don’t dig the Mansion wallpaper, but I wonder why they didn’t round things out with the ballerina? 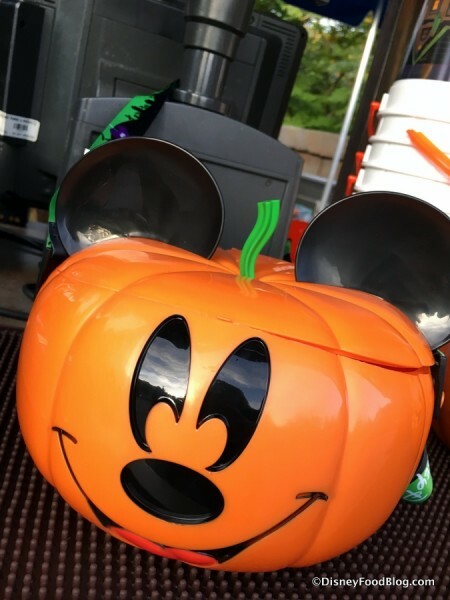 Is the Micky pumpkin bucket only available st the party ? Please consider sugar-free desserts. There are so many diabetics of ALL ages who would love a treat! Are the treats all snack credit eligible? Awesome post! I want to go!!!! 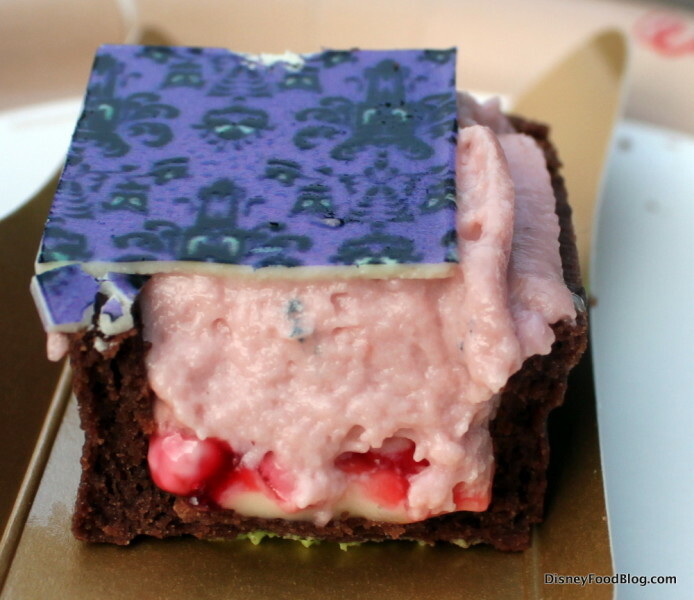 can you tell me, are any of these wonderful treats (especially the Haunted mansion desserts) available for purchase anywhere other than Disney parks? If not, they should be! It would be great if there was a food component to the Disney Store website…..
AJ, you rock! I am so thrilled they finally improved allergy options. In years past you had to hand in a bag filled with nut candies just to get safe options. This also allows for the trick or treating experience! Thanks for reporting! Are any of the popcorn carts in the MK flavored? Wanting the pumpkin!!!! Why no love for the tightrope walker? 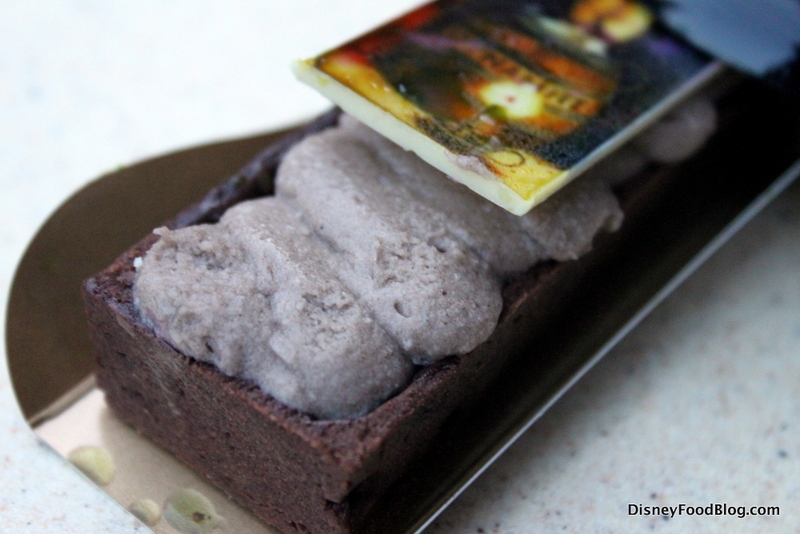 Although I have to say the rest of the Haunted Mansion desserts do look amazing. Hoping these stick around for future Halloween parties since I won’t be making it down there this year. The Haunted Mansion is my favorite ride at Disney and it’s always nice to see some goodies representing this awesome ride. 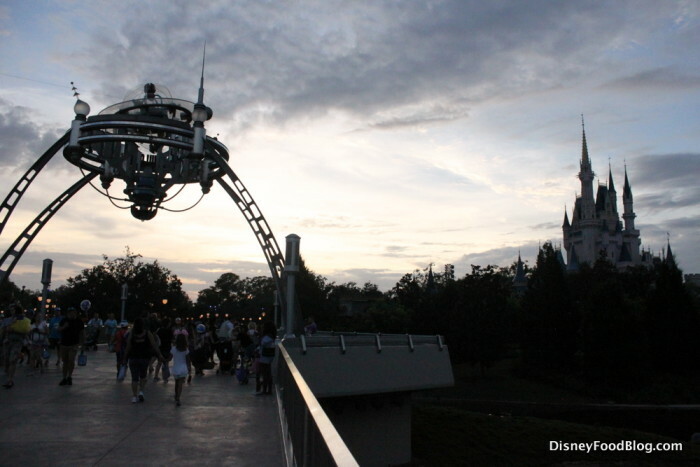 I believe the tightrope walker is over a crocodile/alligator, and Disney stopped selling most anything with crocodile/alligator branding after the incident with the toddler. I cannot wait to try the Haunted Mansion desserts!!!! 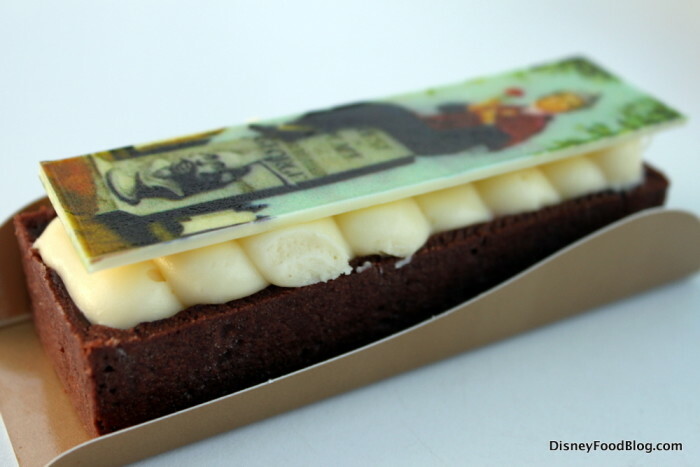 I have always loved the Haunted Mansion attraction and I am super excited for these treats!! Overall I think this is shaping up to be the best party to date for amazing treats. Kudos to y’all for the informative and honest reviews and great pics!! Keep up the awesome work!! Can you tell us the price of the Haunted Mansion treats? They look fantastic! So if I read this right, the only general things you can get at Disneyland during the Halloween season are the cinnamon rolls, pumpkin ice cream and cupcakes. 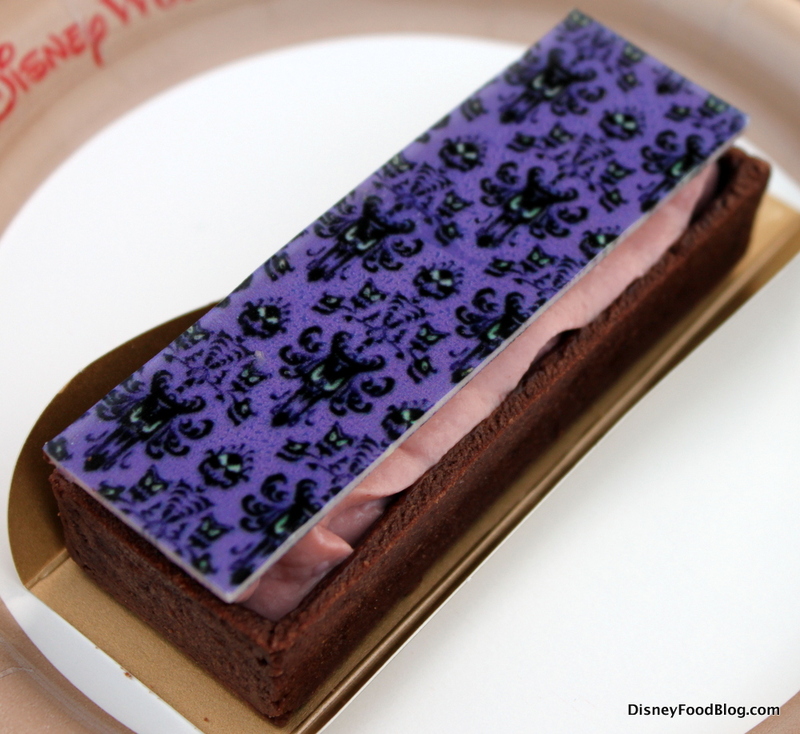 Do you guys have a post for all the other Halloween treats available at Disneyland Park during the Halloween season? I would like to try the candy corn soft serve. 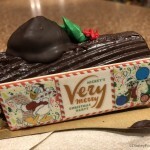 Also, the Mickey choc marshmallow cupcake and one of the HM tarts, but they would go back to my room with me. I have to spread the sweets out! No Candy Corn ice cream review? Does anyone know if it’s actual candy corn flavored ice cream or if it’s just vanilla with crushed candy corn sprinkled on top of it? 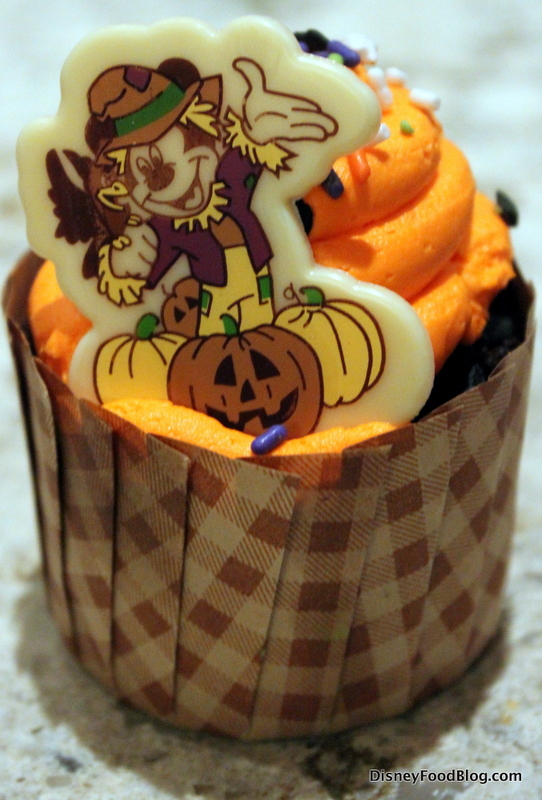 Can you clarify which of the Halloween party treats you can use a snack credit on the dining plan for? 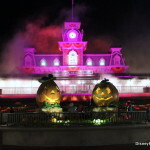 Can’t wait to be there in October MNSSHP !! Already have our tickets !! I really want the popcorn bucket to !